One Lovely Blog Award - All Things Special Ed. Hello! 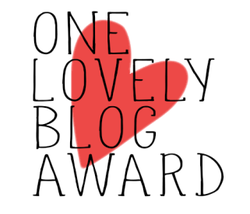 Thanks to Nicole from Adventures in the ATC, I have been nominated for the "One Lovely Blog" award!! Wow that means so much to me and I am ecstatic that someone would nominate me! I truly have enjoyed getting to know other special education teachers and consultants that are from all over the country and other parts of the world. It is an honor to just get to know them and learn from them so I am happy to accept this wonderful award from a fellow blogger and teacher. I am a new blogger and I have just started this past year so I have lots to learn but it has been a wonderful experience that I can't wait to see where it takes me. 1. I have been married to my wonderful husband for almost 9 years. 2. We have twin boys who turned 4 this past March, Reilly and Liam. They are not identical and are totally different little people. 3. I always say it was meant to be (2 boys) as we had 2 beagles (Sully and Hannah) and 2 bengal cats (Brooklynn and Madison) -- and then came the 2 boys. My parents have since kidnapped one of my bengal kitties (Madison) as she was never a fan of the beagles. 4. I am obsessed with iced lattes. I prefer Dunkin' Donuts Iced Carmel Latte Lites. 5. I have taught special education for 10 years. 6. I have my degree in regular education, special education and a Masters in Teaching and Leadership. I always thought I would be a 2nd grade teacher but landed my first job in special education and haven't wanted to leave. 7. I have lived in Wisconsin all my life and learned how to ice skate when I was 2 years old. My grandparents lived by a lake so as soon as the lake froze we would shovel an area and then go ice skating. I also played hockey for a few years as that was what my older brother did so I had too. 8. My perfect summer day: farmers market, sit by a pool or go boating, hanging with my friends and family, then a bon fire at night. Well I also wouldn't pass up a shopping trip- typically New York and Company and I love make-up so I would hit up a Sephora or Ulta to get my Bare Minerals. 9. I met some of my best friends (there is a group of 4 of us) on the first day of college and we have been friends every since (going on 16 years!). They also all transferred after a year and a half so I then joined Gamma Phi Beta and I wouldn't change that for the world!